Rediff.com » News » Will Tejas beat Pak, Korean jets in Malaysia? 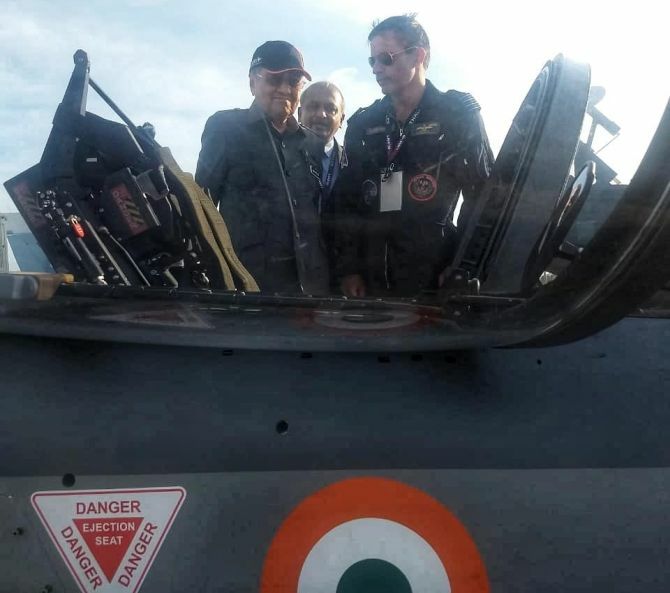 Two Tejas light fighters from the Indian Air Force were in Malaysia to display their aerobatic performance at the Langkawi International Maritime Aerospace Expo (LIMA-2019), which held from March 26 to 30. The royal Malaysian air force will take a final call if the Tejas meets expectations for its light combat aircraft project. Aerospace experts believe Malaysia will choose between three light fighters: Tejas, the South Korean FA-50 Golden Eagle, and the Chinese-Pakistani JF-17 Thunder, which already equips the Pakistan air force. Since the Malaysian air force is still deciding between a supersonic LCA and a sub-sonic fighter lead-in trainer, three additional jet trainers are also regarded as contenders. These include Italian firm Leonardo's M-346FA aircraft, the South Korean T-50 trainer and the Russian Yakovlev-130. In January, Malaysia issued requests for information under its LCA/FLIT procurement programme, expressing interest in acquiring an initial 12 fighters by 2021-22, with an option for 24 more in the future. Hindustan Aeronautics Ltd, which builds the Tejas, also received a request for information and responded in March. Of these six contenders, only the Tejas and the Yakovlev-130 flew in LIMA-2019. 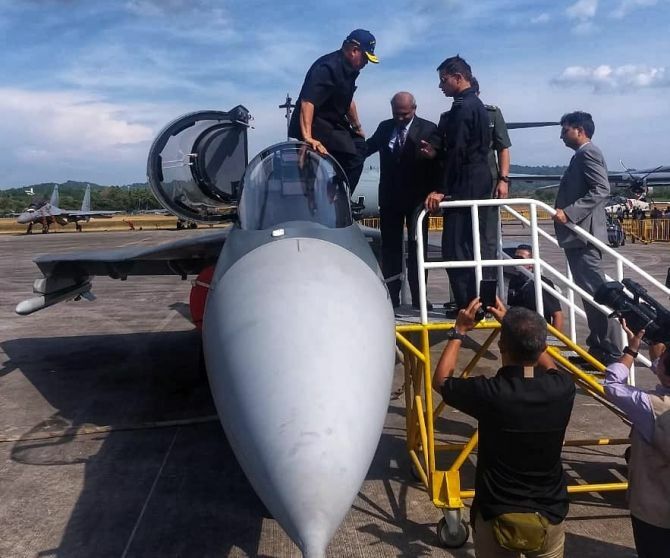 The JF-17 Thunder was a notable absentee, given that Malaysian air force chief, General Affendi bin Buang, while visiting Pakistan last November, had personally invited the Pakistan air force to demonstrate the JF-17 Thunder at LIMA-2019. However, the Pakistani fighter has registered its presence. On March 23, at Pakistan's national day parade in Islamabad, the JF-17 presented an aerobatics performance before Malaysian Prime Minister Dr Mahathir Mohammed, who was the chief guest. The Malaysian air force is procuring an LCA/FLIT under a its 'Capability 55' modernisation programme, which envisages adding a single-engine, supersonic fighter to its current fleet, which consists mainly of twin-engined fighters, including the Boeing F/A-18D Hornet and the Russian Sukhoi-30MKM and MiG-29. Kuala Lumpur has priced the procurement programme at about $300 million, or $25 million per fighter. That is the estimated cost of the JF-17 Thunder, with the Tejas and the FA-50 Golden Eagle priced slightly higher at about $30 million each. However, the ticket price is only one dimension of a fighter's life-cycle costs. There are apprehensions over the JF-17's engine, the Russian Klimov RD-33, which provides low serviceability, requires heavy maintenance and leaves a give-away smoke trail. The Malaysian air force knows this, since its MiG-29s also use the RD-33 engine. In contrast, the Tejas and the FA-50 Golden Eagle both use the highly reliable General Electric F-404 engine, which also powers the Malaysian air force's F/A-18s. Further, the Tejas incorporates a significant amount of Israeli avionics, which also feature in the Malaysian air force's Sukhoi-30MKMs. These factors would reduce the life-cycle cost of the Tejas. In design and materials, the Tejas is the most advanced of the three light fighters. It has a stable design and a quadruplex fly-by-wire system controlled through a sophisticated mission computer. While the JF-17 and FA-50 are built mainly from metal, the Tejas's fuselage and wings feature advanced composite materials, which reduces the aircraft's weight and allows it to carry more weapons and fuel. The Tejas's big drawback is the Indian Air Force's reluctance to back it. In contrast, the JF-17 and FA-50 are strongly backed by the Pakistani and Korean air forces, respectively. The Pakistan air force already flies six squadrons of JF-17s. "It would be a travesty if the Malaysian air force likes the Tejas, but decides against it because it sees the IAF reluctance to back the fighter. The sooner the IAF throws its weight behind the Tejas, the earlier it will crack the international market, where there is already drawing significant interest," says strategic affairs expert Dr Bharat Karnad. 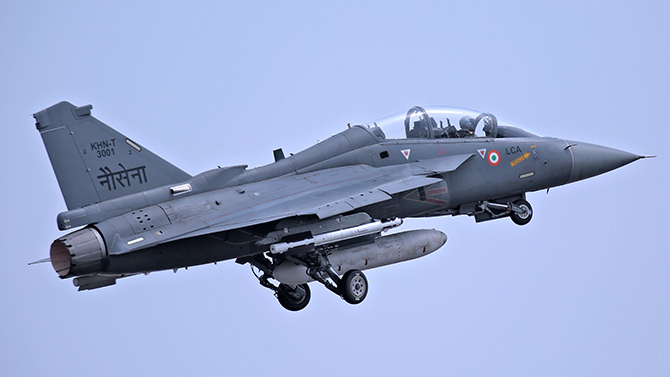 For LIMA-2019, however, the IAF and HAL took a formidable team of 80 personnel and four aircraft -- including two Tejas, one C-130J Super Hercules and one Illyushin-76.